click here to get your free website. We offer articles by Sandra Mizumoto Posey, Ph.D. on a variety of spiritual topics. You are free to copy these articles onto your own site, print magazine, class hand-out, or newsletter as long as no changes, additions or deletions are made to the text. All the information in the box below each article must be included on the document whenever it is distributed or reproduced. 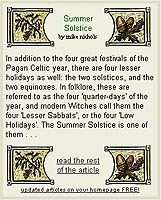 Articles on each of the eight sabbats in the wheel of the year by Mike Nichols will appear on your site automatically at the appropriate time of year. Choose either the longer excerpt or the shorter excerpt, each of which links to the article in its entirety. Create a chatroom for your site! Your free chat room will exist as long as it's used at least once every 14 days. If it times out, though, you can always create it again using this form. Just click here to create your chatroom! Put Esmerelda on your homepage and she'll dole out advice on what you'll need to create a spell for love, prosperity, protection, psychic development, and healing. When you wave your cursor over the cup of coffee, steam will magically rise from the cup. Concentrate on your question, click on the image, and a window containing your fortune will appear. Learn about coffee & your future at the same time! Want to know if you and you-know-who are compatible? Enter your sign on the left, his/hers on the right, and see whether or not you're on fire or merely tepid.